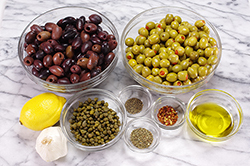 (1) Drain the olives well, toss and turn until the brine has drained. 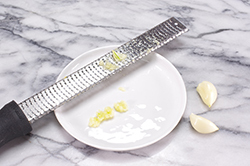 (2) Meanwhile, grate the garlic cloves using a fine zester. 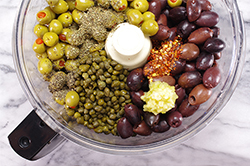 (3) Place in the bowl of a food processor, the olives, grated garlic, capers, basil, red pepper flakes, black pepper, lemon juice, and olive oil. Pulse 2-3 times, scrape down the sides, and pulse again. 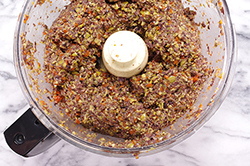 Repeat until the mixture is finely chopped, but not pureed. Transfer from the food processor into a medium bowl. 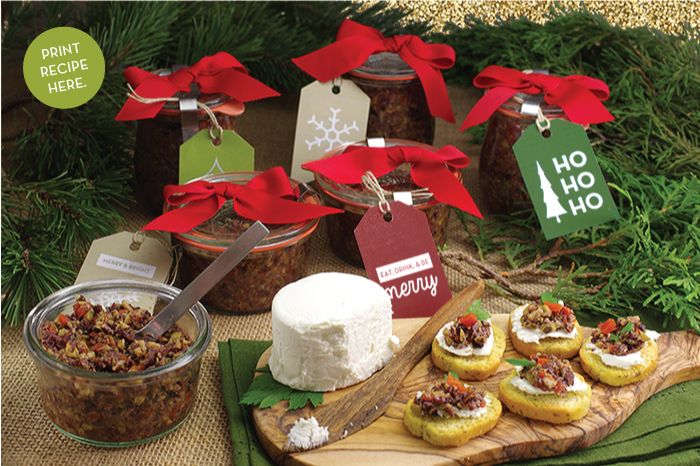 (4) Place the tapenade into half-pint jars for giving, and refrigerate for up to two weeks. Or, if serving as an appetizer, halve the recipe. Pair with goat cheese and crackers or crostini. Garnish wit parsley and pimentos.